Simpler solution architecture – aligning data models across event processing and services will reduce data transformation needs. It will greatly reduce the need for data mapping and complex adapters. Events can be internal or external and can impact business processes in several ways. An external event could initiate a business process (thereby a new process instance is created), or alter an existing process (execution is moved from some kind of wait state or an existing instance could be terminated). These events could be data, state, or a combination of the two impacting a business process. The business process instance might take an alternate path or spawn a new instance of another process as appropriate. Process instances themselves can be implemented by leveraging several service capabilities. These service capabilities need to share a consistent set of domain-relevant interfaces. The process instances can then be loosely coupled with services thus enabling the service implementations to evolve over time. As state changes happen in a process instance, outbound events can be generated – these are publications or notifications that are of interest to potentially multiple consumers. 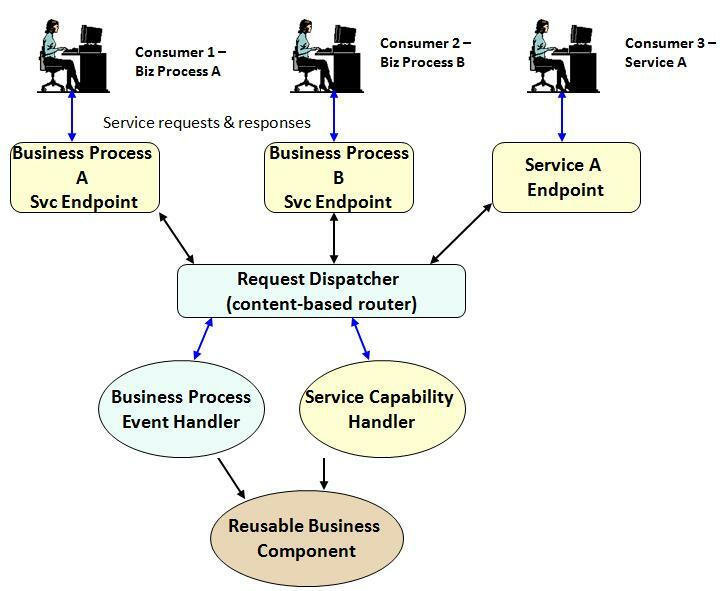 Service capabilities can be leveraged for not just creating/changing data but also when encapsulating business rules for decision steps, as well as for publishing messages to downstream systems/processes.